This section gives a brief overview of the implementation and deployment phase. The details of activities and the set of associated diagrams are described in Figure 1. The Implementation and Deployment phase aims at implementing and deploying the agent-oriented solution designed in the previous phase by adapting it to the chosen object-oriented implementation platform. This part of the work is thus dependent on the implementation and deployment platform. The Janus platform is jointly developed by the Systems and Transportation Laboratory and the Centro de Investigación de Tecnologías Avanzadas de Tucumán (es). It is specifically designed to deal with holonic and organizational aspects. The goal of Janus to provide a full set of facilities for launching, displaying, developing and monitoring holons, roles and organizations. its implementation of the notion of Role as a concrete implementation-level entity. In contrast with other platforms such as MadKit, Jade, and FIPA-OS, in Janus the concept of Role is considered as a first class entity and it is at the same time a behavior and a status. 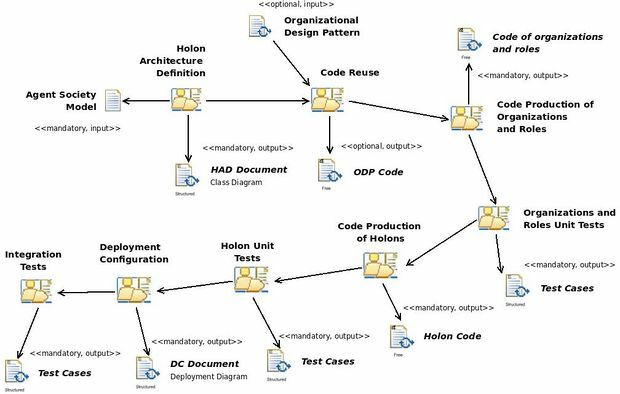 It thus allows to directly implement organizational models without making any assumptions on the architecture of the holons that will play the role(s) of a organization.